Corey and I are home from Hawaii!!! We've actually been home since Sunday morning. It was the most amazing trip ever. Everything was beautiful, the scenery was unbelievable, the food was amazing, and everyone was welcoming and kind. We had so much fun. I have to admit, though, I was happy to see the Manhattan skyline out the plane window. Only because I missed Riley so terribly much, though. If he had been with us I don't think we would ever have come home! So what am I up to post-wedding? Right now it looks like the Bed, Bath and Beyond stock room exploded in our tiny 700 square foot apartment. I've been unpacking and organizing and starting on our thank-you notes this week. I'll also be taking some of our things over to Corey's parents' house to put into storage, which greatly pains me but I also really look forward to when we can move and use them all. I'm also headed to the social security office to change my name and then to the district office at work so they can get everything set up for my class with my new name. I'm also up to lots of lesson planning and preparations for the new school year. I'm super excited to be teaching 3rd grade this year but even though I student taught in 3rd, the standards are different so I'll need to do some extra prepwork as I plan my lessons. I've spent some time chatting with my friends. We've all been looking forward to the wedding events as a reunion for so long since we don't all get to be together as much as we like. The wedding weekend went by so quickly so there's still so much catching up to do! Corey, Riley, and I have just been trying to get settled in back at home and getting back into the swing of things. I'm trying to get our apartment back to normal - which is squeaky clean and perfectly organized, which is really tough now that we have more stuff. 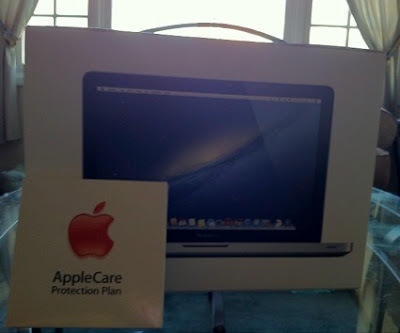 I also made a little shopping trip to pick this up for Corey yesterday. He's been talking about it nonstop lately but he didn't think I'd actually agree to get it for him. We put some wedding money into our savings account but he really wanted a new computer. He's had the same macbook since he was a junior in college and most recently has been using my macbook pro when he needs a computer. I picked it up to surprise him yesterday. He's been doing more work at home at night and using my computer, which just wasn't going to cut it next week when I'm back at work! 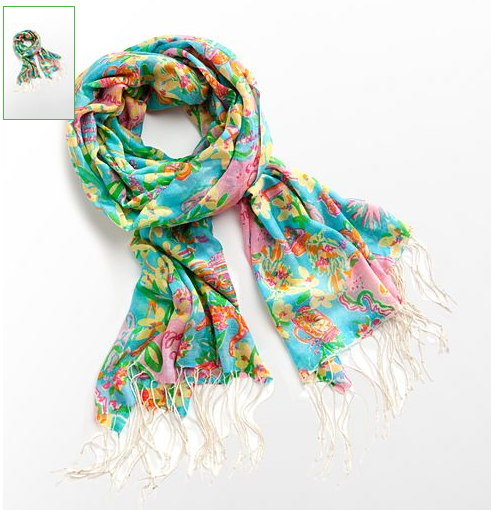 This is the murfee scarf in the South Carolina state print. When I first heard about its impending arrival last week, I knew it had to be mine. I have several nice scarves but I usually don't splurge on them, however I just HAD to have the South Carolina print, especially since I'm away from home. Maybe it'll help me feel closer to home on this cold New Jersey winter ahead! I'm looking forward to getting back into the swing of things here in on blogger. Happy Thursday lovelies! Hey there Life With Elizabeth-ers! I’m Allyson, and I blog over at Cupcakes and Candy Canes. Elizabeth was kind enough to allow me to guest post while she is enjoying her honeymoon, and I couldn’t be more excited. While I mostly blog about everyday life, these days that is including more and more wedding planning (love). My mother and sister have been my very best resources in helping me plan, and I would be totally lost without their help. Even though we have just started getting our feet wet in the planning, I have already learned so much…and I’m loving it. 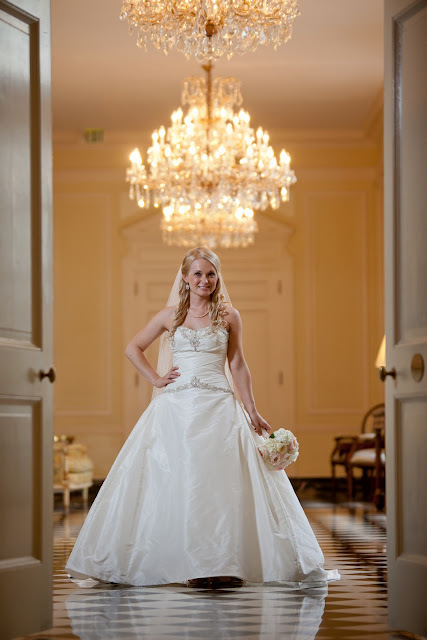 While I am by no means an expert in the planning business, I thought I might share some tips I’ve learned about what to look for in a photographer. Here we go! - Common sense! If she walks in staring off into space and has no ability to corral people for photos that’s a deal-breaker. - Organization – it may seem obvious, but I would never want someone just randomly snapping shots of every little thing (however good they might be) without taking the important ones with family, friends, etc. - Knowledge about the field…because I have none. 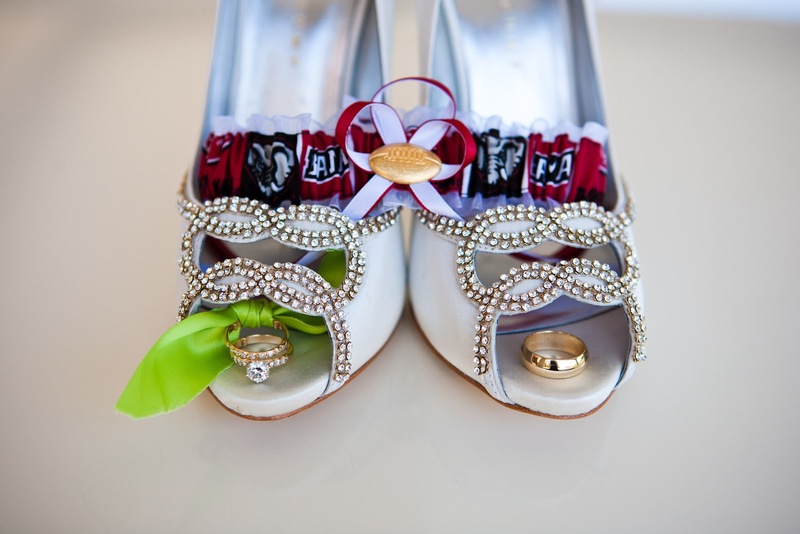 I am definitely going to get a wedding album (like this). Although she does not include this in any of her packages, the photographer knew exactly what we were talking about and said that we could in fact order through her. If she had looked at me with a blank expression and not known what I meant I probably would have gotten up and left. - An open mind. 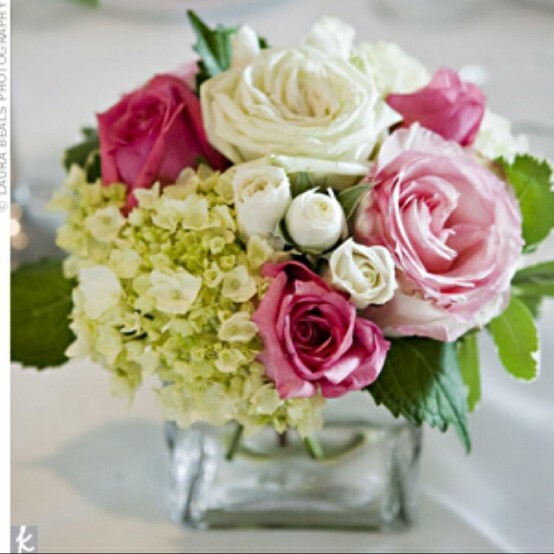 While I need the photographer to have some pretty concrete ideas, it is also so nice to be able to share inspiration (…Pinspiration) and add some more personal touches to the day. 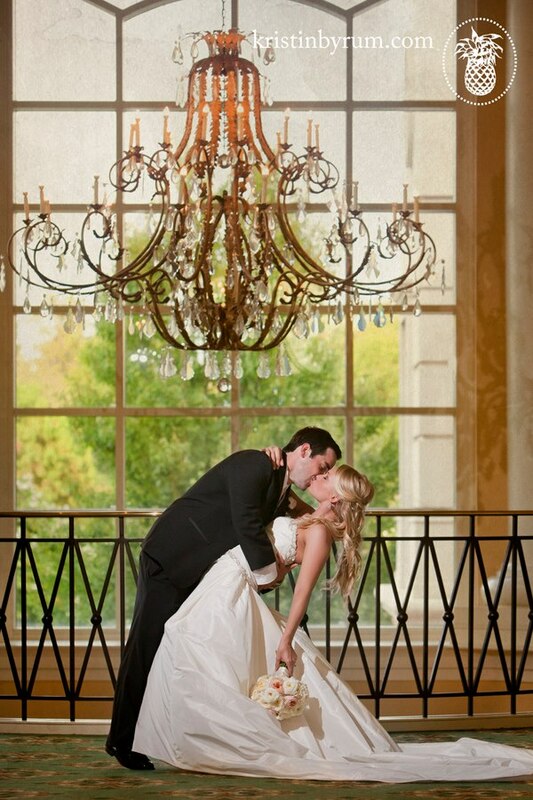 Snapshots are great, but I cannot wait to have real wedding photos! I’m so glad I got to hang out with y’all today, and I hope to see you around Cupcakes and Candy Canes sometime! What were your favorite parts of planning? 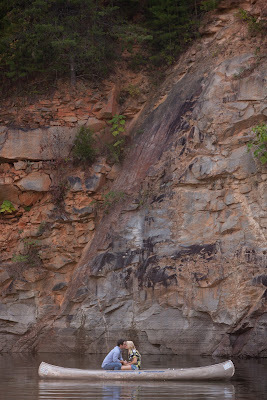 Do you have any go-to photography tips…or any kind of tips for that matter? Hey everyone! 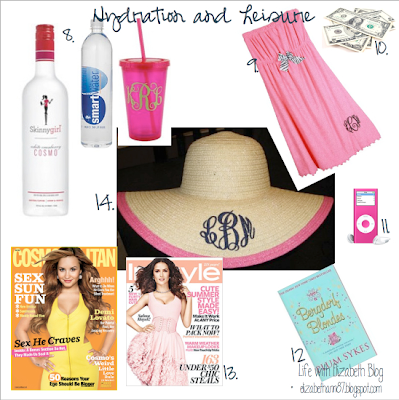 My name is Katie and I blog over at Sweet, Pink and Preppy. 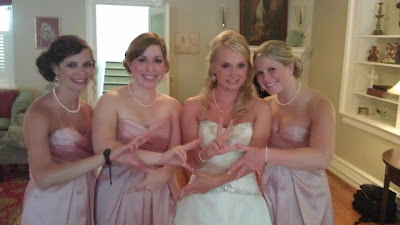 I’m so excited to be guest blogging for Elizabeth today, and I cannot wait to see pictures of her as a bride! I’m a newlywed myself, and one of my favorite pre-wedding activities was putting together our registry. I absolutely love to cook, and it was so exciting to get new gadgets for my kitchen from our sweet families and friends! I am always thrilled to get a bridal shower invite, and I love to check out a couple’s registry and pick out a perfect gift for them. While it may seem weird/gift-grabby to make a list full of things you want, your family and friends want to get you a gift, and a registry allows them to get you something that you actually will use. I think it’s very important to sit down before creating your registry and think about what kind of couple you are. If you’d rather attend a party than host one yourself, you probably don’t need a ton of entertaining pieces. If the thought of drinking a martini gives you and your fiance a headache, then you shouldn’t register for 12 martini glasses. A decent set of tools are indispensable in the kitchen. This set, the Ici Silicon Tools from Williams-Sonoma, are my absolute favorite. 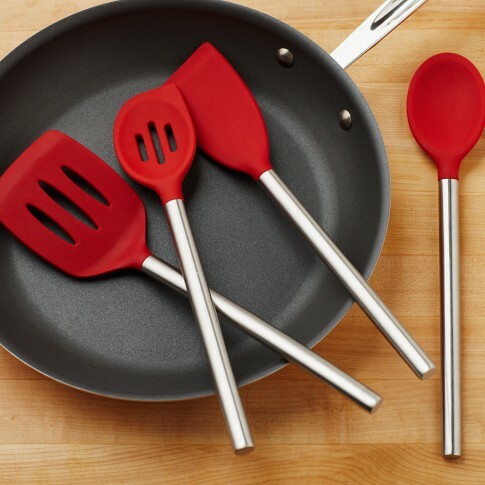 They work incredibly well with my nonstick pans, and they are lightweight. I’d recommend playing around in the store with the different tools and see which ones feel the most comfortable to you. It’s also important to consider what type of pans you have/are registered for - some pans require that you use a certain type of tools. 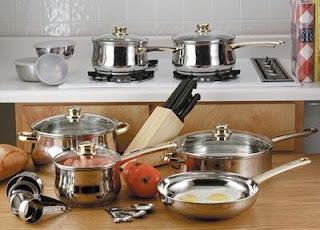 The quality of your pots and pans can really affect the way that your food cooks. One of my biggest regrets is not registering for new pots and pans. I have a nonstick set that isn’t that old, but I know that sooner rather than later the nonstick coating will begin to flake and it will be time for new ones. I would definitely recommend a stainless steel set. 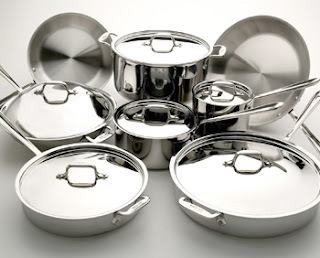 All-Clad pots and pans are my dream pans - but they are pricey! I’m planning on replacing my pans a little at a time. Whether you bake your cookies from scratch or are a break and bake kind of girl, it’s important to have a few nice baking pieces. I’ve had so many cheap cookie sheets that would warp in the oven once I put them in and produce burned cookies. For cookie sheets, I recommend AirBake pans - they are vented in the bottom, which promotes more evenly baked cookies. 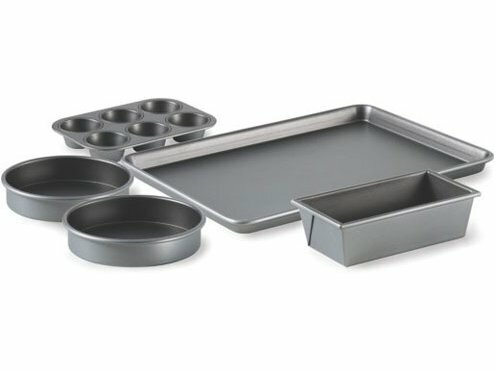 For any other bakeware, I registered for Calphalon products and so far I like them a lot! Like I said before, it’s important to take your individual situation into account. If you aren’t going to make a cheesecake anytime soon, you don’t need to worry about a springform pan. Extra kitchen things, especially bakeware, will just take up space. If you’re anything like me, you didn’t splurge on good sheets for yourself during and after college. I am so happy that we registered for a nice set of sheets. Bed, Bath and Beyond has several 500 thread count options that are priced very reasonably. Our sheets are one of my favorite gifts that we were lucky to receive! Right after we made our registry, I showed it to my cousin who is also a newlywed and asked for her opinion. She suggested that we add a few home decor pieces, and I was convinced that no one would get any of them for us. Surprisingly, we received all of them! It was really nice to move into our apartment after the wedding and already have some pretty frames and candlesticks to spruce the place up! 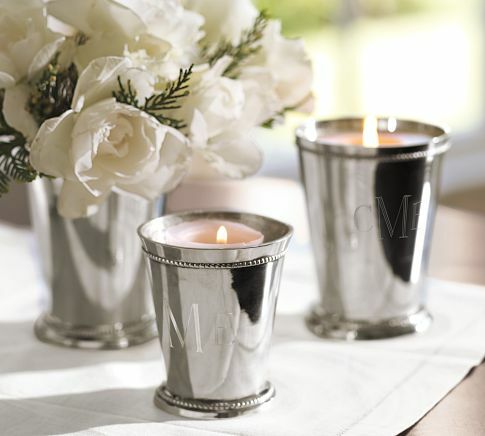 I hope this list helped out anyone who is getting ready to create a registry! Don’t be afraid to put things on your list - the worst that can happen is that you don’t get them, and you can always use giftcards or your completion discount towards them. Be respectful about your family member’s budgets - for example, a $300 margarita maker might not be the best choice for your registry (I’m looking at you, husband). Thanks again to Elizabeth for letting me stop by! 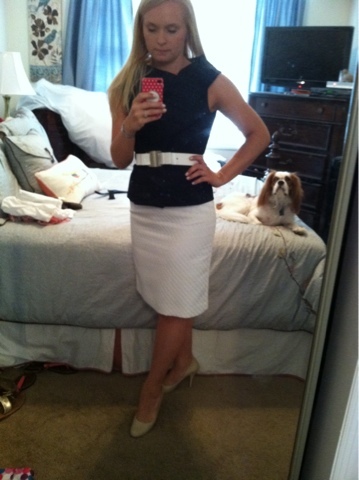 Feel free to stop by my blog for recipes and all things preppy! 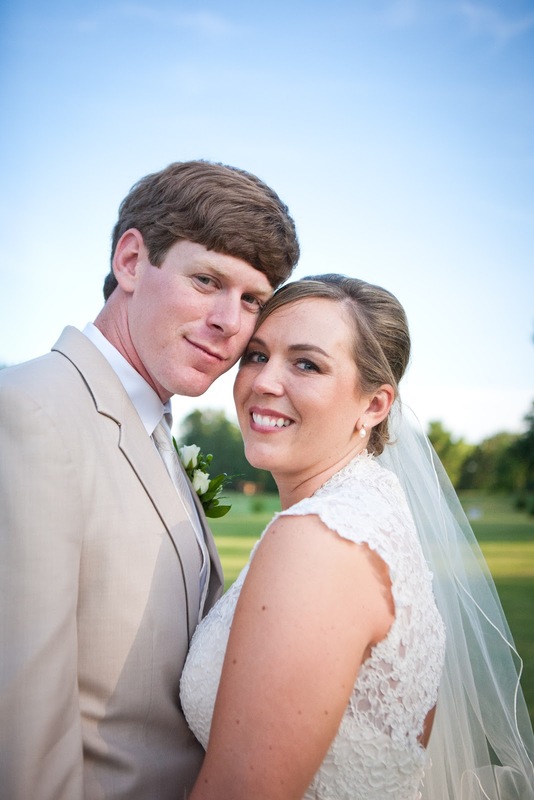 I'm so excited to be able to guest post for Elizabeth today while she is celebrating her marriage! 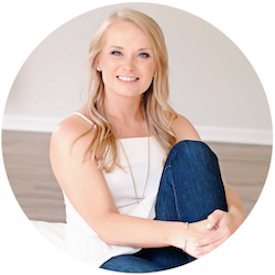 I've just loved following along her journey of wedding planning and we've enjoyed telling stories and sharing ideas! Today I thought it'd be fun to give you a quick glimpse at my wedding planning and inspiration for our wedding which is April 6, 2013! 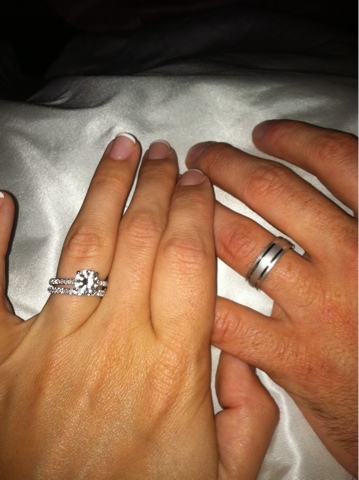 I'm Annie and this is my fiance Kevin on the night we got engaged in Hilton Head. You can read that story here! First things first - location. I grew up in Maryland, he grew up just outside of Charlotte, North Carolina. We live in uptown Charlotte (and met here too!). It was only fitting that we got married uptown. 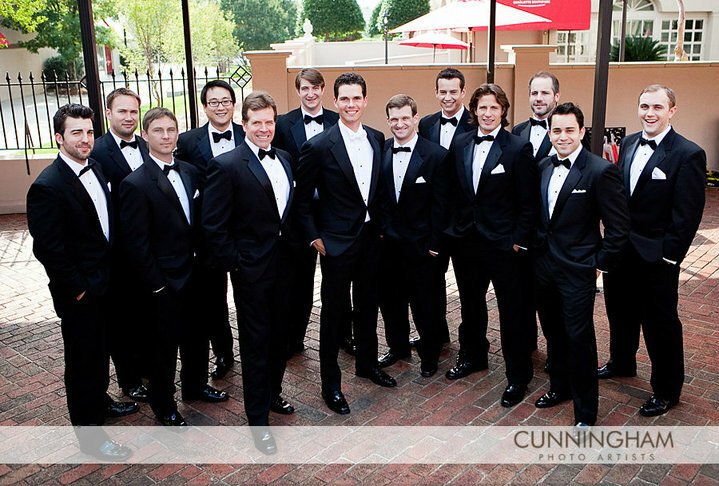 St. Peters Episcopal is the church, Charlotte City Club is our reception location! 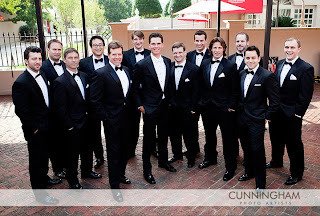 Then we decided on Lula Kate (Chandler) bridesmaid dresses and classic tuxes for the guys! Colors for our event will be blue-ish emerald (the color of the bridesmaid dresses) and a light coral. We'll also pair some champagne and light gold with it. I think they're unique colors but very pretty for an evening wedding in Charlotte in the Spring. 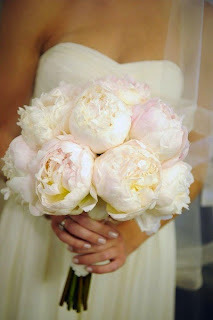 Flowers - I'm all about the peonies! Coral peonies to be exact. May have to use some garden roses too because it's a little early in the peony season, but we'll see! As for music - we got the band Still Cruzin'. They call themselves the party band of the south! ;) Looking forward to that! Feel free to come follow along as I wedding plan, share recipes and talk about what I did last night on my blog, Classic Annie! Visit me here! 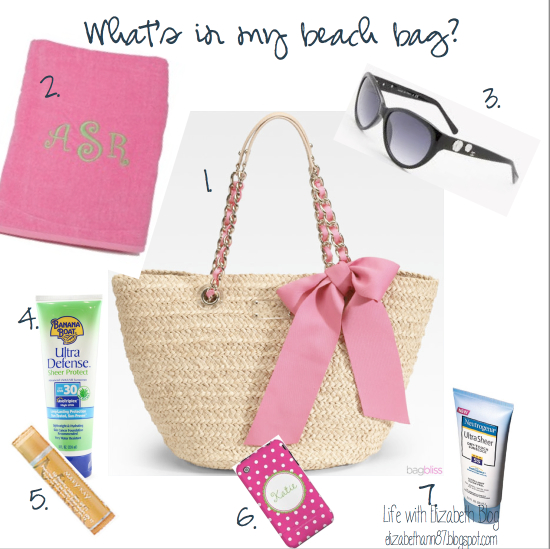 While I'm enjoying the beaches of Hawaii, here's an idea of what is in my beach bag. 1. Cute straw beach bag. I’m actually currently still carrying a pink and gold freebie from Victoria’s Secret last summer but I've been dying to switch out to a straw bag. Isn’t this one presh? Its by Kate Spade, one of my biggest fashion loves. 2. 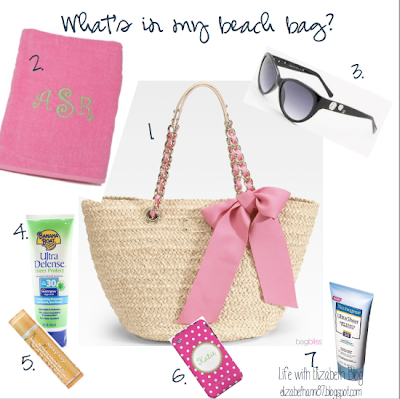 A cute beach towel, preferably monogrammed. I especially love the big ones made for two people so I can spread out and not get too sandy. 3. Sunglasses. I recently got a pair of new Chanel sunglasses for free so I’ll be sporting those, as pictured, this summer and hopefully, many summers to come. 4. Sunscreen. Safety first, girls! I usually wear SPF 30 on my body. I like Banana Boat’s Ulta Defense Sheer Protect. It feels very lightweight, which I like. 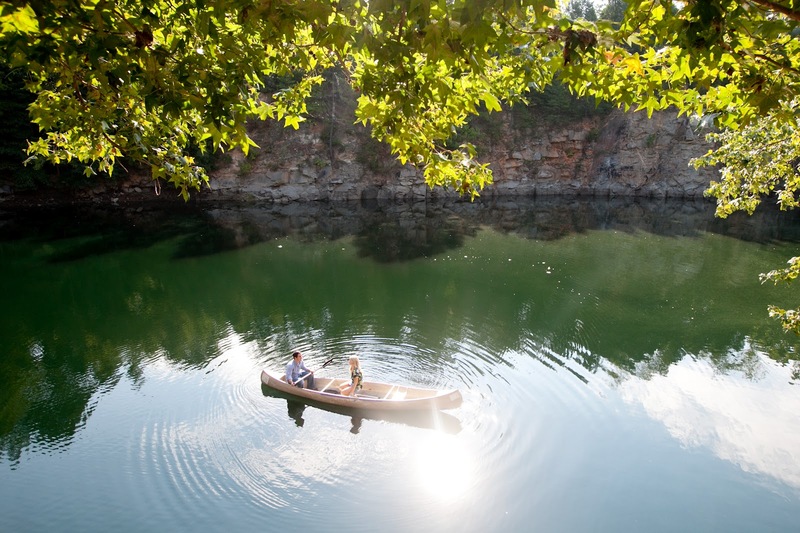 Make sure your sunscreen is broad spectrum and protects you from both UVA and UVB rays. 5. Mary Kay’s SPF 15 lip balm. Its so easy to forget about your lips but they need protection too! Sunburned lips are no fun. 6. My phone, which of course sports a cute pink polka dot case. I can’t be separated from my friends and family! 7. Neutrogena Ultra Sheer Faces sunscreen in at least SPF 55, but to be honest I sometimes use the 70. I use Tan Towels on my whole body (especially my face during summer months) for color and try to be especially careful to protect my face from natural sun. 8. Hydration essentials. Adult bevies are always appreciated on vacation. Skinnygirl is a love of mine. 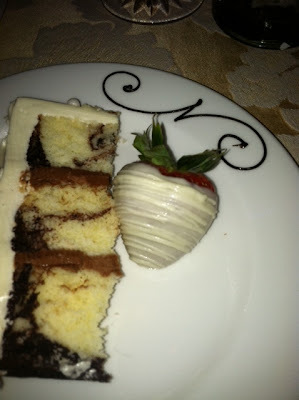 I’m so grateful to Bethenny Frankel for making delicious treats with low calories. My current fav is the Cosmo. It tastes just like water with a splash of cranberry. ;) I’m also dying to try the white peach margarita. With all those cosmos and margaritas, lots of water is a necessity. I always bring along a double walled tumbler, too. Mine is from Marley Lilly and I love it. 9. A cute cover up. If you want to break for lunch or wander into one of the beach bars, its great to have a cute cover up in your bag. The one pictured I ordered for my honeymoon, also from Marley Lilly. She steals my heart with the monogramming. 10. Cash. When the craving for a pina colada strikes you, you don’t want to wander into that cute little beach bar and be told that they don't accept credit cards. Its better to be safe than sorry in those types of situations. 11. My iPod, which is actually the one pictured. Yes, I’m aware that it is ancient. But hey it works, and it lets me relax and listen to music on the beach. 12. Some cute chic-lit. I can never read Bergdorf Blondes too many times. I’m hoping the new Emily Giffin book will be out in time for me to take on my honeymoon. 13. Girly magazines. These are my two favorites. I love InStyle as I love fashion and Cosmopolitan is a guilty pleasure of mine. 14. A cute sun hat. 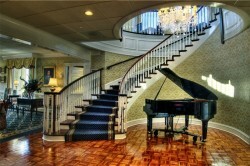 I ordered the one pictured with my new monogram. Its so great for sitting outside for lunch as it can give your face and shoulders relief from the sun during the most dangerous part of the day, and it looks so chic! Well, that is it ladies! What essentials do you keep in your bag that I may have left off? Hi y'all! I'm Courtney and I blog over at Southern Somedays. I originally started blogging about our wedding planning, decorating our home and starting a life after college. But now that our wedding is over (thank goodness!) I am able to actually blog about the other two fun things going on. Today, I'm going to share with you some of my favorite Etsy purchases from the wedding. Etsy is like Pinterest to me. I could spend hours just searching for neat purchases, but instead of like Pinterest where you could completely fail at a project all you have to do is actually click the buy button. It seems to work out better for me then Pinterest. While I was wedding planning, I had a few specific items I really had my little heart's desire on for our wedding. The first was beautiful calligraphy for the envelopes and I knew I really wanted to the invitations to be letterpressed. I searched for over 3 months for the perfect invitation and never found anything worth pursuing. After looking on Etsy I immediately found Elecia's site and fell in love. 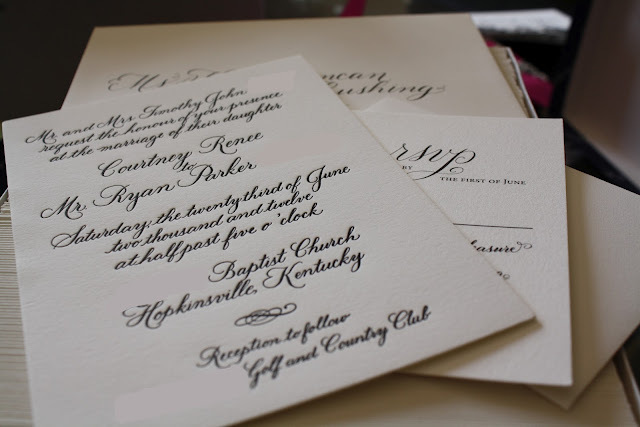 What could be better than calligraphy and letterpress in one? Absolutely nothing! Not to mention how great of customer service she has, she was hands down my favorite of all my wedding vendors. My husband is a huge Alabama football fan. Yes, we don't even live in Alabama but he is obsessed. I had thought about the idea for one of those cute lace garters but once I had my eyes on this beauty, I knew the search was over. Bo was another great Etsy seller; she was super fast getting my order to me and had great communication. Our reception venue did not want us doing a sparkler sendoff so I had to think of something creative. 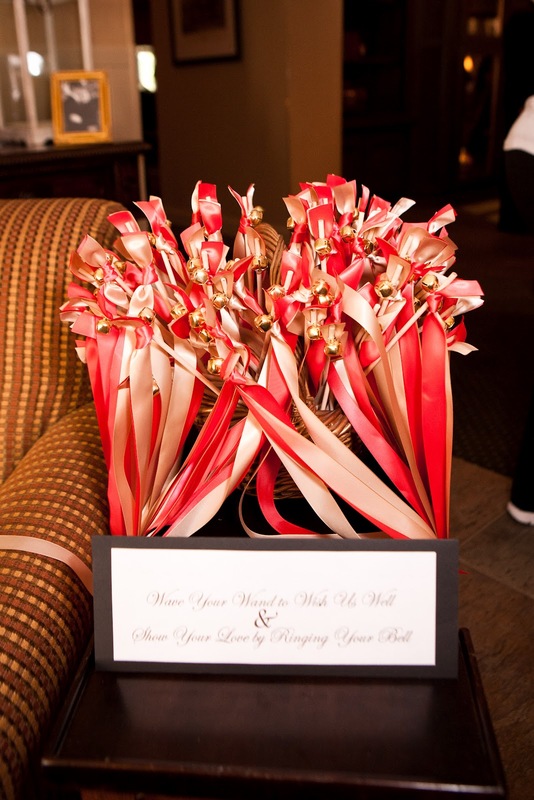 I had seen several people do pom poms for their favorite teams but immediately went to Etsy and found these adorable streamers, plus they even came in our wedding colors. It definitely was a great purchase and made for some great pictures since our wedding party decided it would be fun to break them out before the reception was even over. 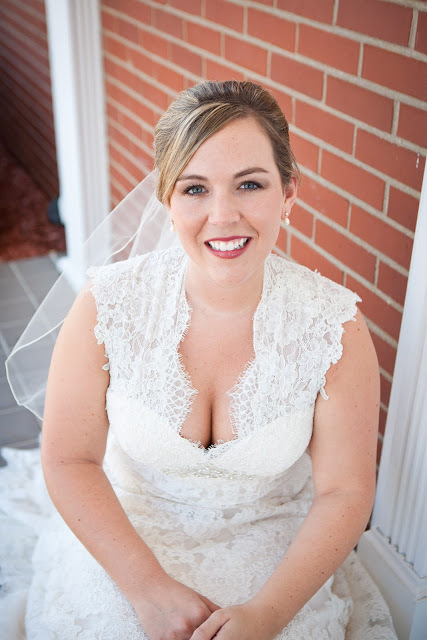 Bridal Talk Tuesday - the best day ever! Kappas before the ceremony. This melts my heart. I love these girls! Ballroom shot, featuring the head table. Love the blush linen peeking through. 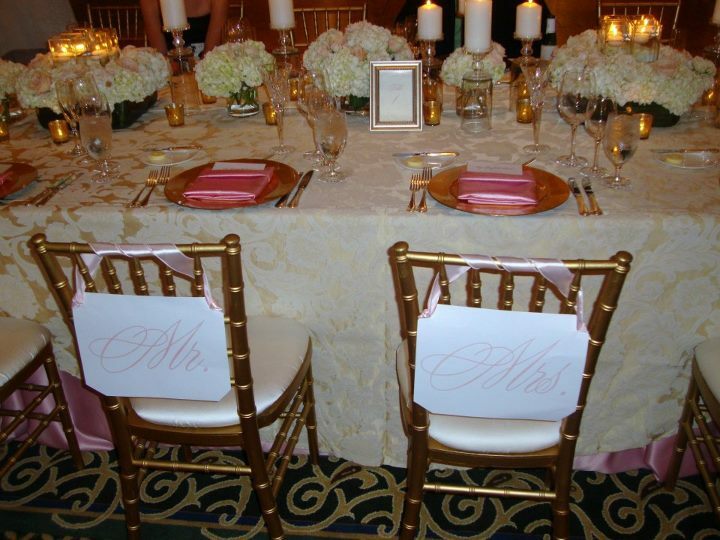 Mr. & Mrs. chairs. Love the gold chargers with blush linens. 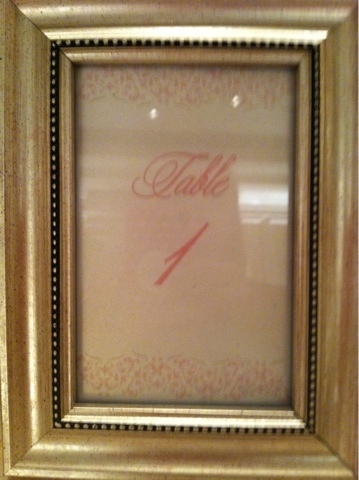 Ahh...Carolina Wedding Design! 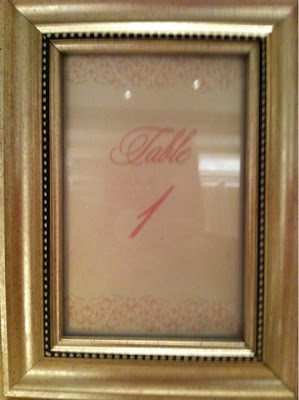 Table numbers that Cortenay designed in the gold frames I searched for in three different states until we found enough. 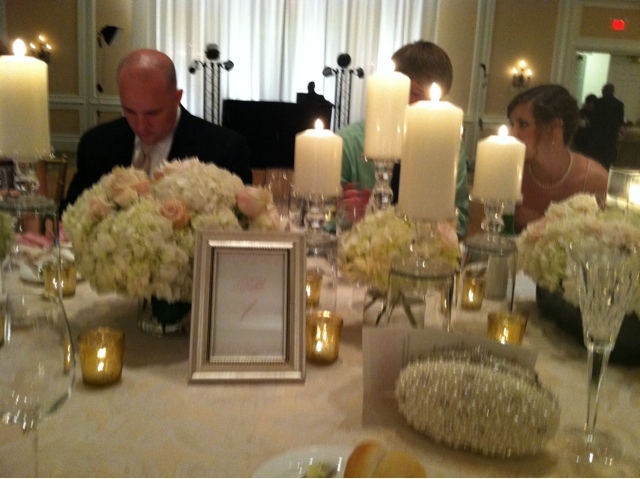 Head table from my seat, including the pearl clutch I found the day before the rehearsal at none other than....Marshalls. The cake! Which was as tasty as it was pretty! 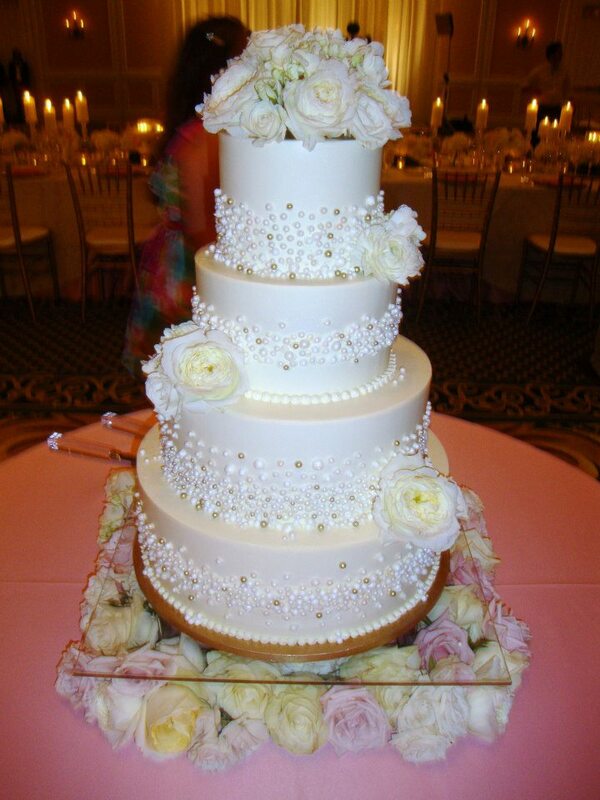 Cake Lady Jill is amazing! 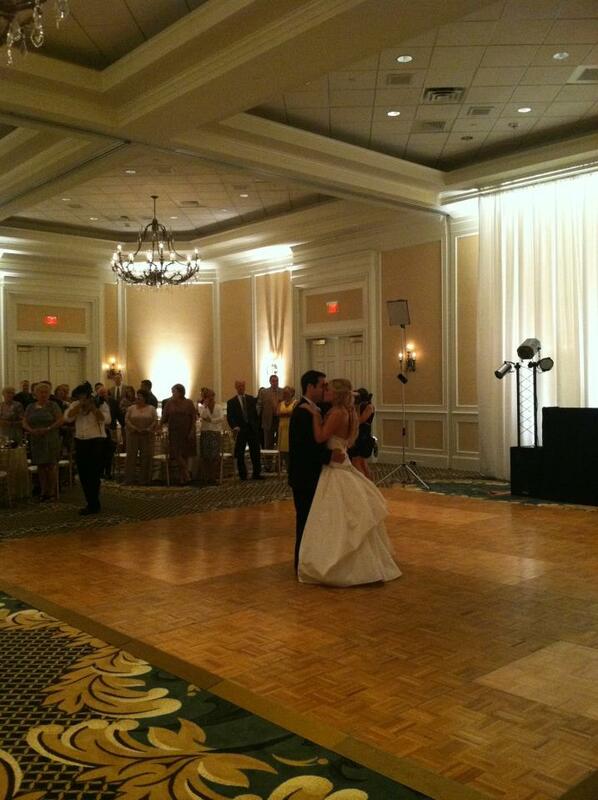 Our first dance. To Ben Harper's Forever. 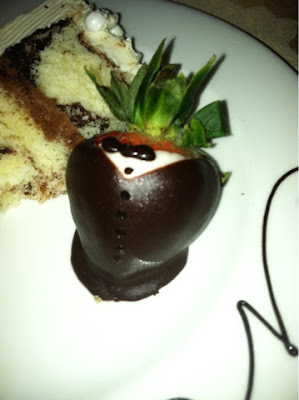 Corey's cake with the tuxedo strawberry. Our amazing server made sure my cake had a bride strawberry. 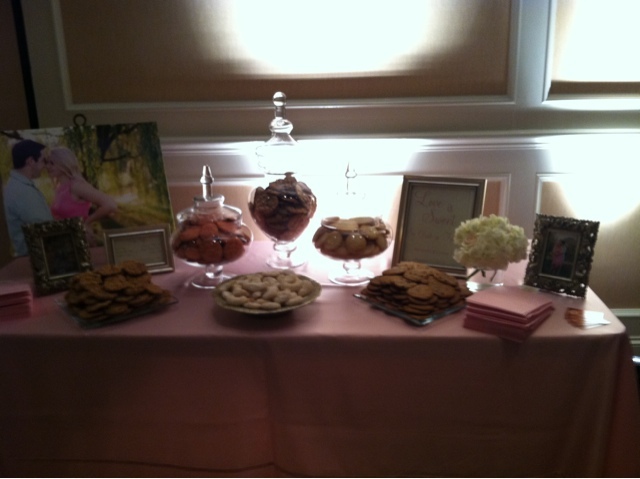 And of course - the cookie buffet favors! While Corey and I are honeymooning, I have four fabulous ladies lined up for a wedding guest blogger series. 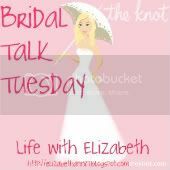 On Tuesdays and Thursdays for the next two weeks, these ladies will be here chatting with you about all the details of wedding planning from choosing your photographer to building a registry. Don't miss out! Aloha, lovelies! Today is the day! Our wedding day is finally here! This post is scheduled to publish the minute I'll be walking down the aisle. I finally get to marry this amazing man, who is so perfect for me. He's everything I dreamed of in a husband - my perfect counterpart. I'm so excited to start our life together! And I'll be wearing this beautiful dress, which is everything I dreamed of and as my maid of honor said, "the most Elizabeth dress she'd ever seen." 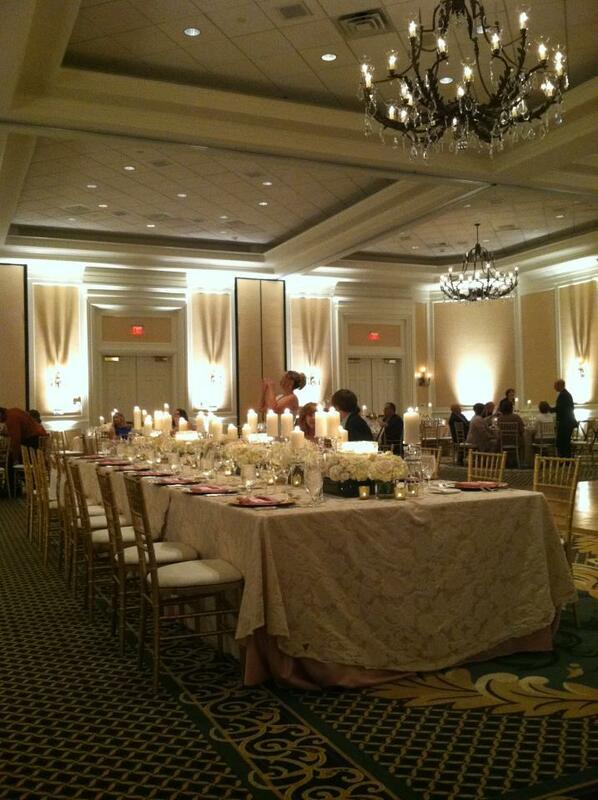 I can't wait to celebrate with all our friends and family tonight over dinner and dancing. A special thanks to our wonderful families, our venders, our fabulous wedding planner, and most importantly - God, for making this day possible. 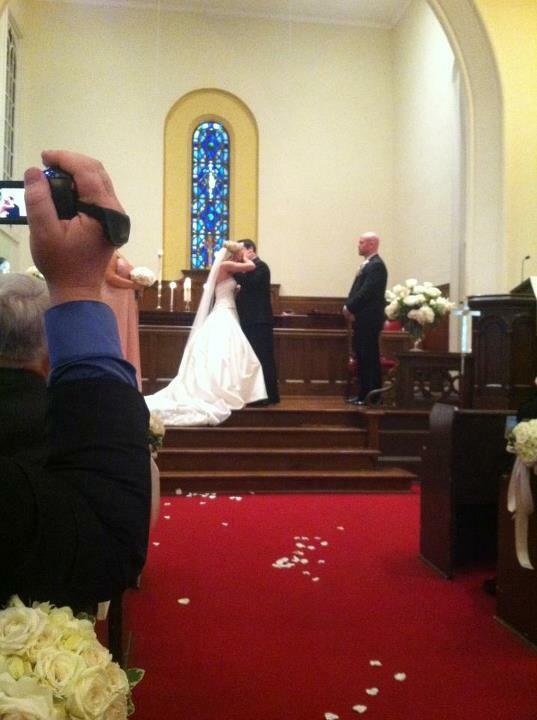 And thank you for following along in our journey to this special day! With all the chaos of last minute wedding planning, there's a little secret that I've been keeping from you. Not intentionally, so much as I've just been super busy finalizing all the paperwork and finishing up our wedding planning. A couple weeks ago, I had the opportunity to wear this cute outfit, which Corey's mom and I purchased earlier in the spring. I was asked to interview for a school district in New Jersey that I have been interested in for pretty much the entire time I lived here. It has a fabulous reputation and many things about it remind me of my old school district in Greenville, SC. Everything happened very fast. I was called to schedule an interview over a month ago and was given one of two open interview slots. I updated my portfolio and prepared a demo lesson teaching fractions with Hershey bars. Oh, how I love third grade curriculum! Just two hours after my interview, I was notified that I was a finalist. Then, I had another interview and was offered the position just a few days later. In a way, this is very bittersweet as I resigned my Kindergarten teaching position in the innercity charter school where I worked last year. Leaving my old school was very difficult because I felt very needed working innercity. I knew I was making a difference, even though my job could be pretty challenging. I gave 110% everyday and often came home completely exhausted. I'm grateful of the challenges because I definitely feel like I've grown. If you're a visitor of Lipstick, Lattes, and Lesson Plans, then you know I now feel like a classroom management pro. I feel really close with the faculty and staff at my old school and will definitely miss them. If I have any teachers reading, then I know you understand how emotionally connected you become with your school. BUT, I am beyond thrilled about the upcoming school year. I student taught third grade and it has been my favorite grade thus far (and now I've done fifth, first, and kindergarten.) Third grade is such an important grade where the kids learn and grow so much. Multiplication, cursive writing, novel studies. I am so excited to be going back to third grade and I can't wait to meet my new group of students. I just know we are going to have such a fabulous time together this school year! I already love my new district and feel right at home. I am so very excited for this new step!